Canadian (from Alberta) Valyria is trying to carve their own path in the heavily populated folk inclined melodic death metal. 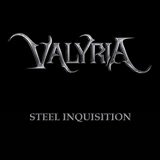 They chose to hinge the entry into this realm on the self-released digitally released single Steel Inquisition. Angled lyrically in the direction of Tolkien/Moorcock novels, the single comes across as a crossover between not so slickly produced latter era Soilwork and second generation of post-Children of Bodom Finnish melodeath/folk metal bands (not so much Ensiferum, but more like Cadacross). After a keyboard padded intro we have a combination of the roughness, stumbling rhythms and growls of the former with rousing happiness and atmospheric flight of the latter. In fact, the clean vocals on Steel Inquisition sound a bit too happy at times given the story does not end well for the protagonist (or so I understand). Epic, progressive and melodic all combine in Valyria’s 6 min effort, but whether the whole album of this craft will be captivating, I can’t quite promise you that.